Unions say agencies are cashing in on teacher illnesses. South Tyneside’s teachers miss thousands of days a year due to illness - and education experts claim supply teacher agencies exploit this to “cream” money from schools. 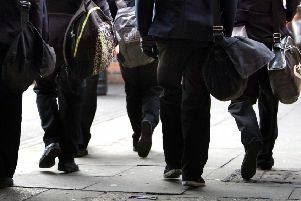 According to the Department for Education (DFE), South Tyneside schools lost 5,549 days to teacher sickness - equating to 142 days a week over the school year. South Tyneside Council dispute this figure, saying the average working days lost per week for teachers in the borough was 97.5 days in 2017/18. The DfE estimates this costs schools up to £75million a year nationally. If schools in the borough covered every sick day with a supply teacher, on the average daily rate of £124, they would be paying £688,000 year. This does not include the “substantial” and undisclosed fees which agencies charge schools - which unions claim can be up to £100 per day. Andrew Morris, assistant general secretary of the National Education Union, said: “Supply agencies cream off millions of pounds every year from schools, charging them substantial fees while paying supply teachers appallingly. A spokesman for South Tyneside Council said: “Last academic year saw fewer teaching days lost due to sickness. “This is good news for our children and young people, who benefit enormously from the skills of our committed teaching staff. “Fewer sick days leads to better outcomes for pupils, which is a core element of our ambition to give every child the best start in life.